Sheldon Keefe was visibly enraged by Sunday’s loss to Lehigh Valley Phantoms. His team not only failed to respond positively to what should’ve been a wake-up call, they arguably produced a worse performance in a 5-0 loss to Providence on Wednesday, one that lacked fight back and was ridden with stupid mistakes. The writing was on the wall just 16 seconds in when a non-committal attempt at the puck by Calle Rosen at the offensive blue line allowed the Bruins to create an odd-man rush against. That mistake was compounded by Jordan Subban, who was caught skating forwards the entire time on the developing 2-on-1 and neither challenged the puck carrier or covered eventual scorer Jordan Szwarz with any kind of conviction as Providence surged out to an early 1-0 lead. 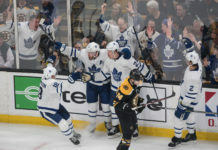 It took Toronto ten minutes to respond with any vigour as the line of Mason Marchment, Adam Brooks and Trevor Moore combined to tee up Vincent LoVerde, but the veteran defenseman’s shot rang off the iron and away to safety. That same forward trio was just about the only bright spot in the game; it looked as if they tied the game inside the final two minutes, but Marchment’s attempt hit both posts and stayed out according to the video review. The Marlies were arguably fortunate to be down only by one after 20 minutes as the Bruins finishing was less than clinical in the opening frame. It didn’t take Providence long to right that wrong as they struck less than two minutes into the middle frame. Jordan Subban wired a shot wide of the net, and after the puck rang around the boards, the Bruins were able to break forward on a 3-on-2 man advantage. At the end of his shift, Moore was unable to get back in time to cover Zach Senyshyn, who scored the Bruins’ second goal. Subban proceeded to smash his stick against the post before tossing the remains toward the center of the ice. Considering Marchment was later benched for taking an ill-advised penalty, I’m surprised Sheldon Keefe didn’t pin Subban to the bench for an extended spell following the show of petulance. A power play for the Marlies should have resulted in Providence taking a 3-0 lead while shorthanded, but Kasimir Kaskisuo bailed his team out with a double save to deny Karson Kuhlman before Cameron Hughes struck the crossbar. Providence kept coming, however, as a giveaway by Andreas Borgman up the wall allowed Anton Blidh to drive to the net and Kuhlman eventually tucked home the rebound during the ensuing scramble in the crease, with Frank Corrado unable to clear the loose puck. Bruins goaltender Dan Vladar was essentially a bored onlooker until he was pressed into action inside the final five minutes of the period. His best stop of the game was a sharp right pad save to keep out Moore’s effort from the slot. The evening went from bad to worse after Toronto took consecutive penalties and gave up two power play goals in the space of just 22 seconds. A bad change allowed Anders Bjork to walk from the right wing to the slot unchallenged to score his first of the season. Senyshyn was then left unattended in front of net and had the simple task of tapping home a feed from Mark McNeill to score his second of the game. The Marlies trailed 5-0 heading into the final frame and rarely appeared as if they would make a dent in the huge Bruin advantage. The 17 shots that the Marlies recorded in the third period gave some illusion that Toronto at least attempted to claw their way back into the game, but Vladar wasn’t nearly tested enough en route to the second shutout of his AHL career. Two power plays created one chance of note, but Chris Mueller contrived to miss a tap-in when left all alone at the far post. That rather summed up the Marlies evening; if not for Providence’s lack of a killer instinct, the margin of defeat could have been even larger. – Shut out for this first time this season, the Toronto Marlies have fallen back to .500 with a 9-9-4 record, sit fifth in the North Division, and have conceded 90 goals in 22 games. – Timothy Liljegren remains absent due to injury. – Michael Carcone took pre-game skate and is expected to take part this weekend, as is Sam Gagner, who will make a welcomed return to the Marlies on loan from the Vancouver Canucks. – Adam Cracknell returned to action for the first time since November 13 (injury). – It’s not been spoken of enough, but Dmytro Timashov has taken 10 double minor penalties in his last 14 outings. With forward help incoming, you wonder if the coaching staff will send a message by dropping Timashov for a game this weekend.